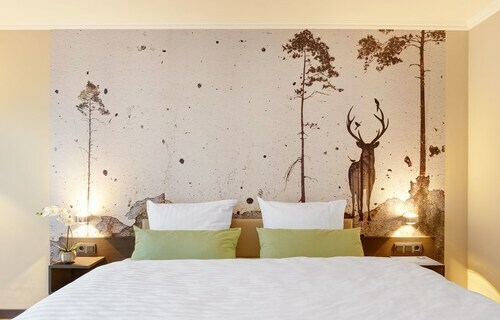 Situated in Aachen, this hotel is within a 15-minute walk of New Tivoli Stadium and CHIO Stadium. RWTH Aachen University and Aachen Cathedral are also within 1 mi (2 km). Aachen West Station is 28 minutes by foot. 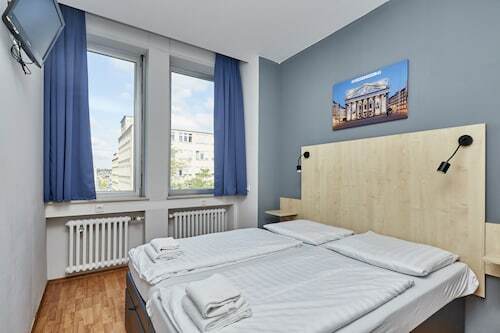 Situated in the historical district, this hostel is close to Marschiertor, Aachen Cathedral, and RWTH Aachen University. Also nearby are Suermondt Ludwig Museum and Theater Aachen. Situated in Aachen, this hotel is within a 15-minute walk of Ludwig Forum and Aachen Cathedral. RWTH Aachen University and CHIO Stadium are also within 2 mi (3 km). Aachen Central Station is 20 minutes by foot and Aachen-Rothe Erde Station is 25 minutes. 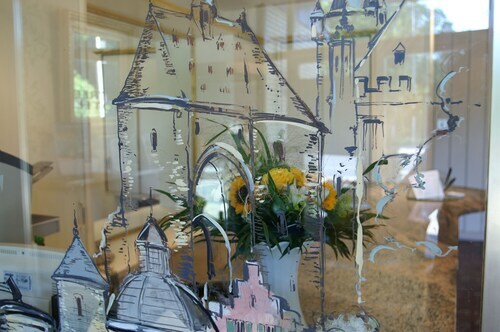 Situated in Aachen, this hotel is within a 10-minute walk of St. Nikolaus Church and Aachen Cathedral. RWTH Aachen University and CHIO Stadium are also within 2 mi (3 km). Aachen West Station is 19 minutes by foot and Aachen Central Station is 20 minutes. Located in the heart of Aachen, this hotel is within 1 mi (2 km) of Ludwig Forum, Aachen Cathedral, and RWTH Aachen University. CHIO Stadium is 1.4 mi (2.3 km) away. Aachen-Rothe Erde Station is 24 minutes by foot and Aachen Central Station is 26 minutes. Located in the heart of Aachen, this hotel is within a 15-minute walk of Marschiertor and Aachen Cathedral. RWTH Aachen University and CHIO Stadium are also within 3 mi (5 km). Aachen Central Station is only a 5-minute walk and Aachen Schanz Station is 12 minutes. This family-friendly Aachen hotel is within a 15-minute walk of St. Nikolaus Church and Aachen Cathedral. RWTH Aachen University and CHIO Stadium are also within 2 mi (3 km). Aachen Central Station is 17 minutes by foot and Aachen West Station is 24 minutes. Situated in Aachen, this luxury hotel is within a 15-minute walk of Eurogress Aachen, RWTH Aachen University, and Aachen Cathedral. CHIO Stadium is 1.1 mi (1.8 km) away. Aachen West Station is 19 minutes by foot and Aachen Central Station is 24 minutes. 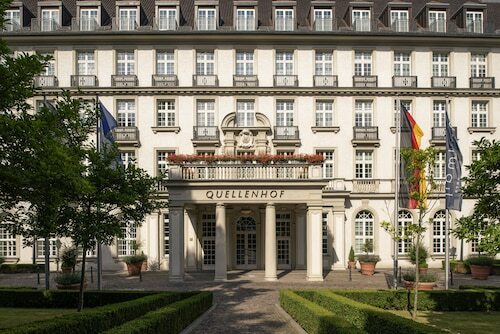 Situated in Aachen, this luxury hotel is 0.7 mi (1.1 km) from Aachener Zoo and within 3 mi (5 km) of Aachen Cathedral and RWTH Aachen University. CHIO Stadium is 3 mi (4.9 km) away. Aachen-Rothe Erde Station is 20 minutes by foot and Aachen Central Station is 24 minutes. 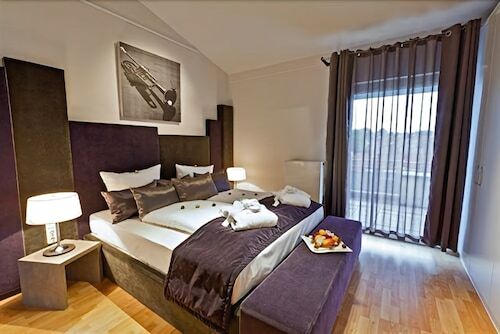 Situated in Aachen, this hotel is within 1 mi (2 km) of New Tivoli Stadium and CHIO Stadium. RWTH Aachen University and Aachen Cathedral are also within 2 mi (3 km). How Much is a Hotel Room in Aachen? Hotels in Aachen start at $28 per night. Prices and availability subject to change. Additional terms may apply. Researching your trip to North Rhine-Westphalia? To experience it like the locals do, research accommodation options which are right near the action in Aachen - Eifel. 5 hotels and apartments listed on Travelocity sit within a 6-mile (10-kilometer) distance. Look through some Travelocity-listed places to base yourself within a 6-mile (10-kilometer) radius, like the Hotel Paulushof and Gemünder Ferienpark Salzberg. 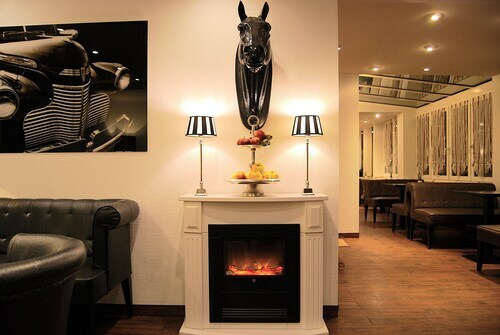 The Hotel zum Walde is positioned 11 miles (18 kilometers) outside the heart of Aachen - Eifel. Another place to stay is the CARAT - Das Vitalhotel Monschau, which is positioned 9 miles (14 kilometers) away. The Burghaus Kronenburg and the CityHotel Stolberg are some other Travelocity-listed places to base yourself in Aachen - Eifel. If time is on your side, why not investigate the many attractions located in North Rhine-Westphalia during your stay here? North Rhine-Westphalia is the home of forests. Popular traveler attractions include ruins. In this fascinating part of Germany adventurous travelers might partake in mountain biking, hiking and cycling. Cologne is 35 miles (53 kilometers) to the northeast of Aachen - Eifel and is where you'll find City Hall and Cologne Cathedral. If you'd like to spend any time in Cologne, be sure to check out the Excelsior Hotel Ernst and First Domizil. Or, you could stay the night in Bonn, 30 miles (49 kilometers) east of Aachen - Eifel, where you'll find the Kameha Grand Bonn and Best Western Hotel Domicil. The University of Bonn and Beethoven House are a couple of the most popular attractions to explore should you visit Bonn. If you love sports and like to watch thrilling games you could spend some time at Borussia Park, which is found 40 miles (65 kilometers) to the north of Aachen - Eifel. Find accommodation not far from the action at the Amadeo Hotel or the Best Western Plus Crown Hotel. Cologne - Bonn Airport is a primary entry point for those flying in and out of Aachen - Eifel. It's located 35 miles (57 kilometers) from the downtown area. For modern travelers who hope to stay in Travelocity-listed accommodation nearby, have a look at Leonardo Hotel Köln Bonn Airport or Airport Businesshotel Koeln. 5.0 Definitely a great experience, check in to check out! This is a great hotel, in a great location with an excellent staff. Everyone spoke English and went out of their way to make sure all of my questions or needs were taken care of. The breakfast was top notch. Wifi was great and easy to use. The parking very reasonable and below the hotel with elevator access. This location is walking distance to the city center and was easy to get back and forth by foot. This was obviously once a Grand old Hotel. It is very quiet. rooms have a balcony, floors in rooms are linoleum (yuck) The price was good, but did not include breakfast. We asked for non-smoking rooms, but all 3 rooms that we had reeked of old cigarette smoke. This place would benefit from new drapes,pillows,mattres, etc. It was very quiet, but more than 30-45 minute walk in to old part of city.